I awake early as usual. Rather than walking before breakfast, I wait and walk after breakfast. Since I am leaving Delhi’s Aerocity Holiday Inn for my flight to Tel Aviv later this afternoon, I decide that I might as well replace my empty roll-on deodorant. In this compact, highly developed area a mile or two from Delhi International, there are restaurants, high-end shops, global businesses, and probably seven or eight hotels. As I’m walking, I see a “24 Seven” which is a small convenience store. I can tell in two minutes that the store carries plenty of water, soft drinks, snacks, and yogurt, but no deodorant. I go to the Pullman Hotel. After the entrance security check, I ask the concierge: “Do you know where I may find deodorant?” Unfortunately, the concierge shakes his head, no. Undaunted, I walk to the JW Marriott Hotel next door. There is the same security scanning; there is the same polite concierge. I ask him: “Do you know where I may find deodorant?” There is a pause “No we don’t have a shop that sells deodorant, but we have a Spa which sells similar products.” Since I’m not interested in paying $20.00 for “similar products,” I say thank you and leave. I decide to visit one more hotel, ask my question one more time, and, with deodorant in hand or not, return to the Holiday Inn. I look around and choose an unfamiliar hotel, the Andaz Hotel. As I walk toward the front entrance, I notice an unusual amount of activity compared to the Holiday Inn, the Pullman Hotel, and the JW Marriott. I proceed through the usual security clearance. The guards look at me a bit more intently. “Maybe I really do need deodorant” I say to myself. As I start to walk toward the double doors, two rather serious men leave the hotel, stand in front of me, and intentionally or unintentionally, block my walk through the Hotel entrance doors. As I’m standing there, within fifteen seconds, about a dozen men in khakis make their way to the doors, some remaining inside and some coming outside. A very expensive, glistening official looking black car pulls up across from me. I realize that something is happening. So I pause. I simply stand there. I wait. I have one of those weird sensations where you know inappropriate thoughts are running through your mind. Do I think about asking him questions like: “What do you think about the prospects for world peace? What do you think about the environmental crisis?” The question that goes through my mind is “I wonder if he knows where I could find deodorant?” Weird! Our minds sure are strange. Upon returning to my hotel, I google news about the Dalai Lama. The Dalai Lama is at the Andaz Hotel for the global launch of his Social, Emotional, and Ethical Learning program for young people. This program has been developed in coordination with Emory University in Atlanta, my alma mater. 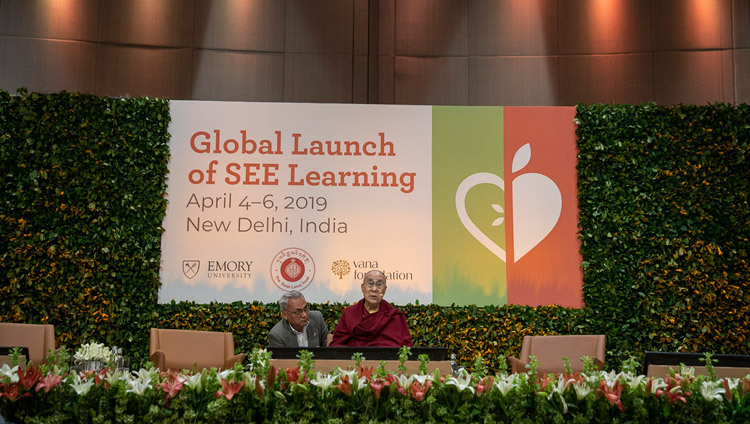 In consultation with Emory faculty and representatives of His Holiness, a curriculum has been created for all grades combining values and scientific approach to address the reality of suffering, understanding that suffering, developing empathy toward those who suffer, and developing ways of knowing the appropriate response. In fact, if I had walked around the lobby this morning, I might have seen my fellow classmate and Emory Vice-President Gary Hauk. If I had been there the day before, I could have listened to Gary described the history of the SEE program. The conference had some deeply committed speakers and participants. Kailash Satyarthi, pictured below, was awarded the Nobel Peace Prize in 2014 for his struggle against the suppression of children and young people and for the right of all children to education. He spoke at the conference. One last word. I never did find my deodorant.